Jan 5, 2016 | (Mis)Adventures! So if you follow my blog, you have probably come to realize that clearly I like making lists. Haha! I guess I just find it easier to talk about things if I have some sort of order to talk about them in, otherwise my ADD brain will just jump all over the place and I won’t make any sense. So here is my list of why I am super excited for Viva Las Vegas, which is happening April 14-17 this year. Being born and raised in Vancouver BC in Canada, I am used to the cold west (wet) coast, so when I have a chance to escape and go somewhere warm and sunny where I don’t have to wear 3 layers of sweaters and scarves I am pretty darn excited about it! You may be surprised that I love the sun by looking at my pastey white skin, but fear not, I have SPF 100 and an umbrella. Prepare to be blinded by my neon white glow! 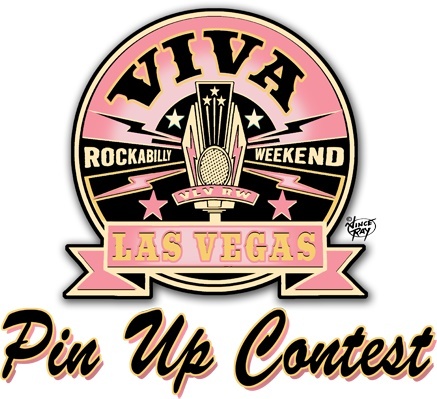 I am so thrilled that I have been selected to be a potential finalist in the pin-up pageant at Viva Las Vegas! All you have to do is vote for me at www.vivalasvegas.net/pin-up-contest to help push me into the final round. Voting ends on January 29, so make sure you cast your vote before then. Oh and my name is Evilyn13 in case you forgot who’s blog you are reading. If you have a spare moment please also vote for my sister from another mister Frankie Faux under www.vivalasvegas.net/burlesque-competition so she can join me and be one of the featured performers at Viva Las Vegas. I’m excited to be getting away with some of my closest friends and I’m also excited to meet new friends like YOU! If you see me at Viva Las Vegas, please come and say hi! I promise you I don’t bite (that costs extra). I usually have stickers, magnets or other swag on me if you are interested and I’d love to share some of it with you. And if you are a hot pinup girl I might just share a bit more of myself with you (if you know what I’m saaaaaaaayin) *wink wink* I make a great hot mess! I don’t really think I need to explain this. It’s my birthday the weekend after Viva Las Vegas and I’ll be working all weekend, so I am coming to Vegas to PARTY and get CRUNK! All I want for my birthday is to be surrounded by beautiful pinup girls drinking margaritas with little paper umbrellas in them, is that too much to ask? Remember what happens in Vegas – ends up on Instagram – so make sure you stay glued to my feed so you can laugh at all of my drunken adventures and hopefully this time I won’t drop my phone in the pool. Note to self – do not drink and selfie. I actually LOVE bowling and I’m actually pretty good at it, however Canadian bowling is only 5 pin, so I am going to have lift some arm weights in order to compete in ten pin bowling. Bowling is also a great way to make your legs really sore from doing all those lunges… so basically I really need to get in shape before I head to Vegas. Time to start lifting kegs! Don’t get confused because I’m going to America! I’m talkin’ about photoshoots yo! If you have a great idea or even if you don’t, if you give me enough time and resources we can probably come up with some creative ideas of photoshoots to do. If you are interested in working with me IN A PROFESSIONAL MANNER, please email me at evilyn13@yahoo.com. Please be advised I will have a security person with me at all times when shooting, so if this is a problem for you, shooting with you is a problem for me. To say that I won’t be getting any sleep for a week is probably a gross understatement, but it’s nothing a few cans of Redbull won’t fix! Note to self – bring Redbull. Tickets are still available for Viva Las Vegas but they are selling out fast, so if you are into beautiful babes, hot cars, jumpin’, jivin’ and throwin’ back a bottle of beer, join us for all the fun in Vegas, because who knows what might happen when you spend an intoxicating weekend with me! Note to self – do NOT get married.